Last year I wrote a post on Diwali which is one of my favorites, you can read it here. But somehow this year I could not come up with something as meaningful as last year so this time its an odd limerick coming your way for Diwali wishes instead. and I was unable to produce any rhyme to my own dismay. All I am going to do is a past & present’s comparison. The reasons have changed but the spirit does stay. Only to be survived by the glitters, dry fruits, and Gold. Hiked SMS tariffs this Diwali, I guess it’s gonna be only 140 Character Tweets. The Zing to shout “Happy Diwali” never does faze. 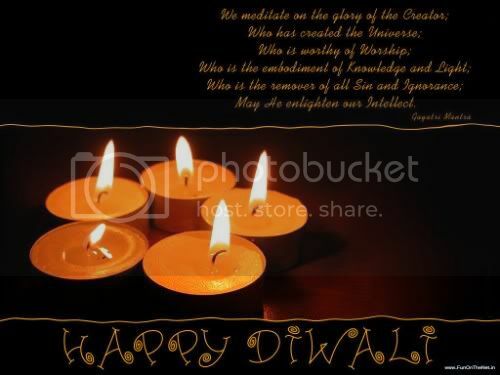 Wishing a very happy and prosperous Diwali to all my readers. @Harshita Sharma: Thanks a lot. Ha ha! Seems like you made the most of your writer’s block 🙂 Happy Diwali to you too, Prats. Hopping over to read your 2008 Diwali post now. Cheerio! @Pal: Well, didn’t have an option. 🙂 Happy Diwali to you too. BTW, will you recommend your web host znet India for web hosting? Are they good hosts? And why not have a comment reply subscription plugin here?! @Vikas Gupta: Thanks Vikas. I have had no problems with Znet and their support has been quick and I haven’t faced much of downtime either. However their basic package does not supports multiple domains that’s where I found a gap. Thanks for the recommendation. I’m not going to them though. check out my blog too..
have a wonderful and prosperous year.